Home > Border Lines – Insights and opinions to improve your shipping and logistics > When Is It Time to Expand to Canada? Management at one Wisconsin-based outdoor apparel manufacturer knew the time was right to expand eCommerce operations to Canada when inquiries from would-be Canadian consumers regularly flooded its customer service center. The manufacturer went to work to develop a strategy for accepting – and fulfilling – eCommerce orders from Canadian customers, and today Canada is an important part of its customer base. This manufacturer joined the growing number of U.S. businesses that have expanded their eCommerce reach to the Canadian market. And with good reason. Research by transaction processor Payvision found 60 percent of Canadian shoppers have made purchases from U.S. websites, while eMarketer predicts Canadian eCommerce spending to grow at a double-digit pace, reaching C$43.95 billion (US$32.7 billion) by 2018. It’s easy to see then why many U.S. businesses have set their sights on expanding to Canada. 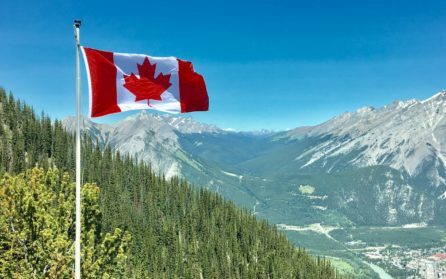 Despite the allure of accessing Canada’s 36 million potential customers, there’s a lot more involved in a Canadian eCommerce presence than simply resetting a company’s website to start accepting orders from Canada. In fact, the road to Canada is lined with U.S. businesses that failed to do their due diligence before reaching out to the Canadian market. The U.S. Commercial Service cites failure to conduct market research; explore sales channels; understand provincial regulations, certification standards, labeling and packaging requirements; and “educate themselves on unique industry matters” among the reasons U.S. businesses struggle in the Canadian market. For an eCommerce business, inventory and fulfillment issues, transportation, returns, and, of course, customer expectations are added concerns. A major issue, for example, is finding a way to make deliveries to Canadians who live in that country’s more remote areas. While 70 percent of the Canadian population lives in urban regions, and 80 percent are located within 100 miles of the U.S. border, an eCommerce provider must have access throughout the entire country. U.S. retailer J. Crew learned the hard way about the importance of solid planning when it launched its Canadian website only to face a strong backlash from consumers over pricing issues. Smart customers were quick to notice the dramatic price discrepancies between identical items offered on both the U.S. and Canadian websites but at a sharply higher cost to Canadian customers. In some cases, once shipping and customs costs were factored in, Canadians were charged almost 50 percent more. Identical merchandise, but at higher prices. The retailer eventually apologized to its Canadian customers and stopped charging duty costs. But the example is a good illustration of the consequences of failing to thoroughly assess the implications of selling to the Canadian market. Businesses that have already built successful eCommerce operations will have a strong foundation from which to expand to Canada. But careful consideration must be given to the nuances of the Canadian market, including the fact that distribution and logistics practices that may work well in the U.S. are not transferrable to other markets. This is why many businesses turn to an experienced logistics provider with strong experience in the Canadian market. A truly qualified logistics provider will have the insight and knowledge of the Canadian market needed to ensure a seamless and successful expansion. As the following discussion will make clear, many U.S. businesses consider their logistics provider among their most important resources. According to the U.S. Commerce Department, fewer than 1 percent of U.S. companies export, and of those that do, most look to Canada as a starting point. This makes sense given our shared border, language, and enduring alliance. But beyond these obvious similarities are some very “uniquely Canadian” characteristics, an understanding of which is critical to success in that market. Canada is officially bilingual, with 22 percent of Canadians listing French as their “mother tongue.” The province of Quebec considers French its sole official language and imposes strict requirements for use of French on signs, packaging, and advertising materials. Canada has its own currency. The Canadian dollar, often referred to as the “loonie,” is the official currency of Canada. More people live in California than in the entire country of Canada. The population of California is roughly 39 million people. The population of Canada is just over 36 million people. Canada is the second-largest country by area in the world. China is the first, the United States is the third. This is especially significant for eCommerce retailers, since it means that shipments will need to be delivered to fewer people, spread throughout greater distances. Most Canadians live within 100 miles of the U.S. border. 80 percent live in close proximity to the border, while 70 percent live in urban areas. Urban Canadians no longer get home mail delivery. In 2013, Canada’s national postal service, Canada Post, announced it was discontinuing home delivery to more than five million Canadian households and moving them to “community mailboxes.” With this action, Canada became the only nation in the G-20 without home mail service. Canada’s unique tax requirements. Any retailer selling goods to Canadian consumers must be in full compliance with Canada’s sales tax requirements. Virtually all goods are subject to a 5 percent federal Goods and Services Tax (GST). In addition, some provinces impose a Provincial Sales Tax (PST), which must be paid directly to the province. Other provinces combine the GST and PST into a Harmonized Sales Tax (HST), which is collected at the border by Canada Border Services Agency. Very strict email/text requirements. Canada’s “anti-spam” law went into effect in 2014, which imposes severe restrictions on the use of commercial electronic messages including email and text messages. The law requires businesses to ensure recipients have consented, either expressly or implicitly, to receiving those messages. In addition, consumers must have an easy way to opt out and unsubscribe from receiving additional messages. A U.S. business expanding to Canada must take the time to understand these and other characteristics of that market. The U.S. Commercial Service publishes a “Canada Country Commercial Guide” that provides essential background information a business can use as the basis of its strategic plan. Of special importance to U.S. eCommerce retailers though is an understanding of that country’s online market. How strong is the demand for eCommerce options, and why is it that 60 percent of Canadians have made purchases from U.S. websites? Analysis by Forrester Research predicts Canadian online spending to grow at a rate of 12.3 percent annually through 2019, when it will reach C$40 billion. Online sales will grow at a pace almost five times higher than traditional brick-and-mortar stores. Forrester’s analysis also predicts online spending will represent 9.5 percent of total retail transactions in Canada by 2019. By comparison, separate research from Forrester, as reported in InternetRetailer, estimates that U.S. eCommerce sales will account for 10.3 percent of total retail transactions by 2018. According to Statistics Canada, as of 2013 – the last year in which the government conducted a study – only 13 percent of Canadian businesses were selling online. This finding is affirmed by 2015 research by web hosting company Go Daddy, which found almost 60 percent of Canadian small businesses – the majority of business in Canada – do not maintain websites. And 33 percent have no plans to build a website in the near future. At Purolator International, we’re the experts in managing shipping solutions from North America to the Canadian marketplace. As a trusted logistics partner serving many fast-paced industries, our mission is to provide unparalleled customer service complemented by our shipping, tracking and customs expertise. To partner with Purolator International on your expansion efforts to Canada, contact us today.